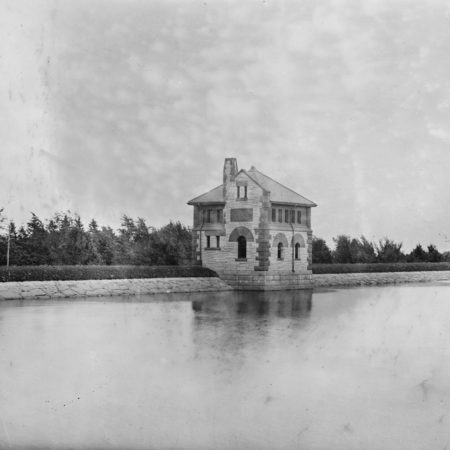 Located within the Olmsted designed Fisher Hill Historic District in Brookline, Massachusetts, the Fisher Hill Reservoir and gatehouse were completed in 1888. 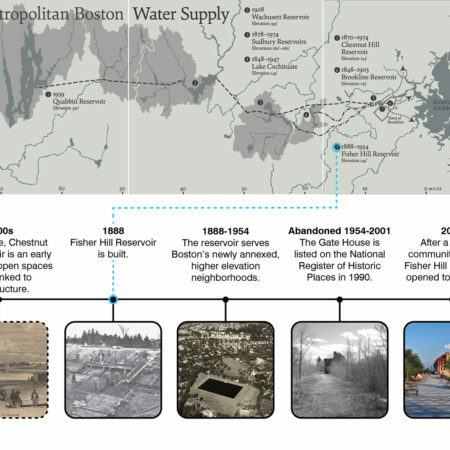 The reservoir distributed water to the area for Boston’s Metropolitan Water District for over 60 years until it was decommissioned, drained and essentially abandoned. 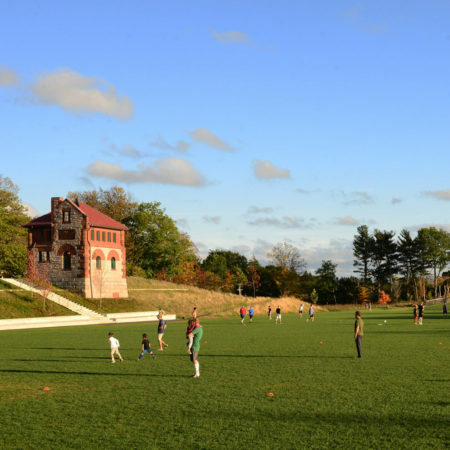 Listed with the United States National Register of Historic Places in 1990, the property was acquired by the Town in 2001 with the intent to create a park for passive and active recreation. 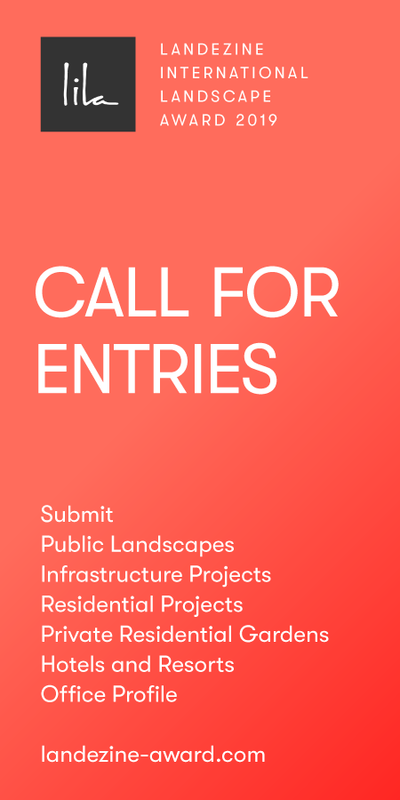 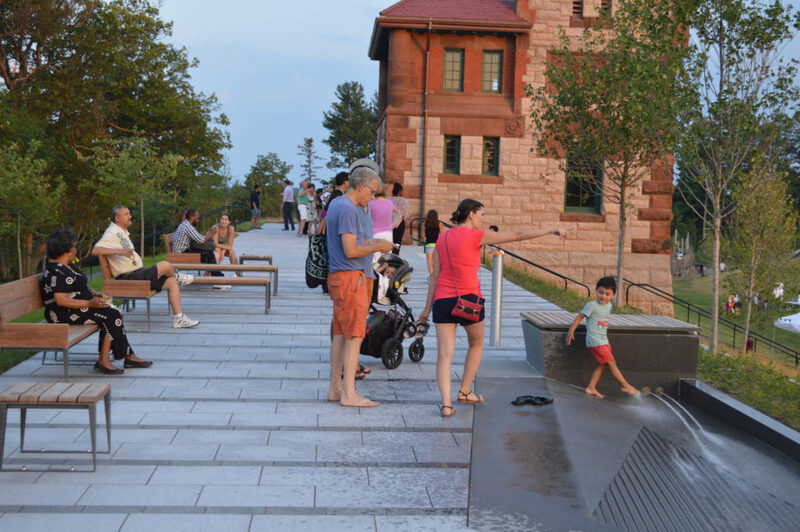 Tapping into the idea that public infrastructure once played a vital role in recreation and public open space around America’s urban centers in the 1800’s, we thought it important to celebrate the reservoir as a cultural artifact. 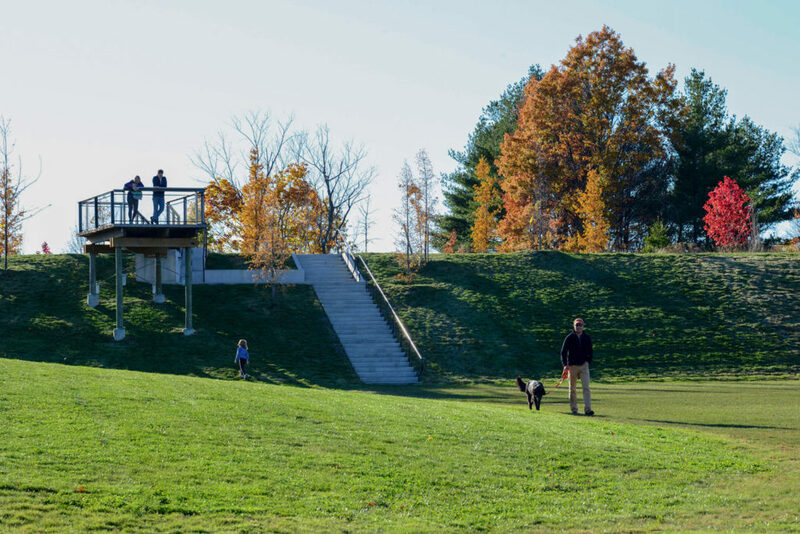 We proposed a substantial departure from the Town’s conceptual master plan that suggested erasing much of the reservoir’s original landforms. 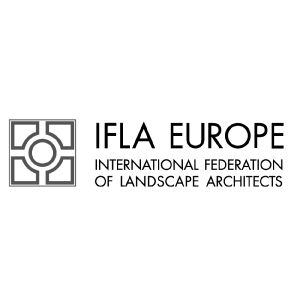 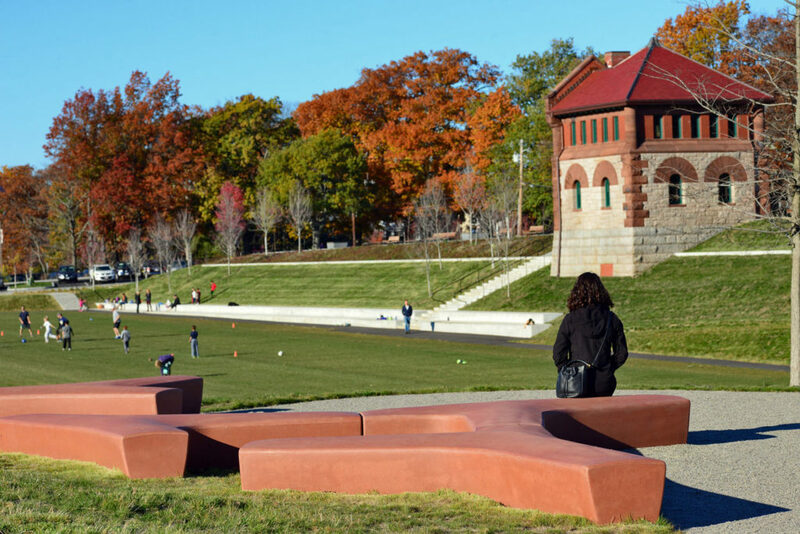 We promoted keeping the landforms as a historic reference to the site’s context within Brookline and greater Boston. 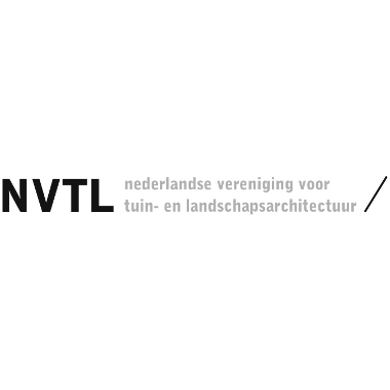 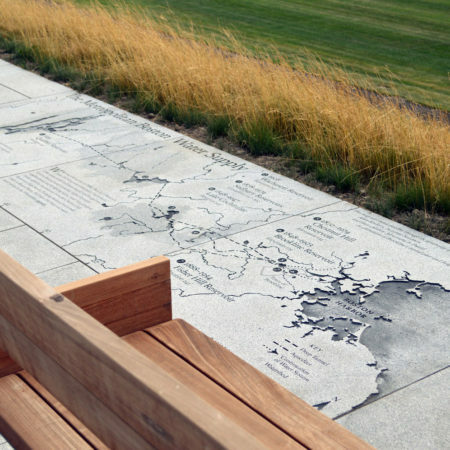 Our approach was to convey the site’s history as a reservoir, using both spatial and interpretive elements, as well as delivering a beautiful and programmatically rich park, worthy of its Olmstedian context. 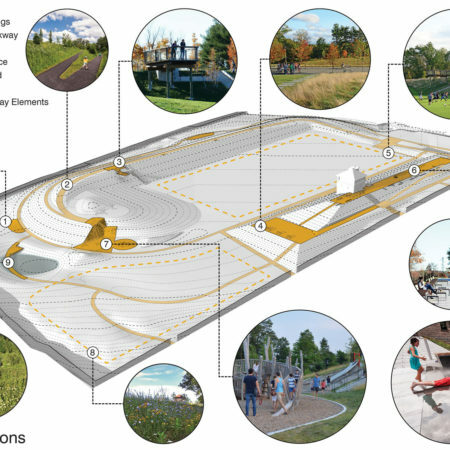 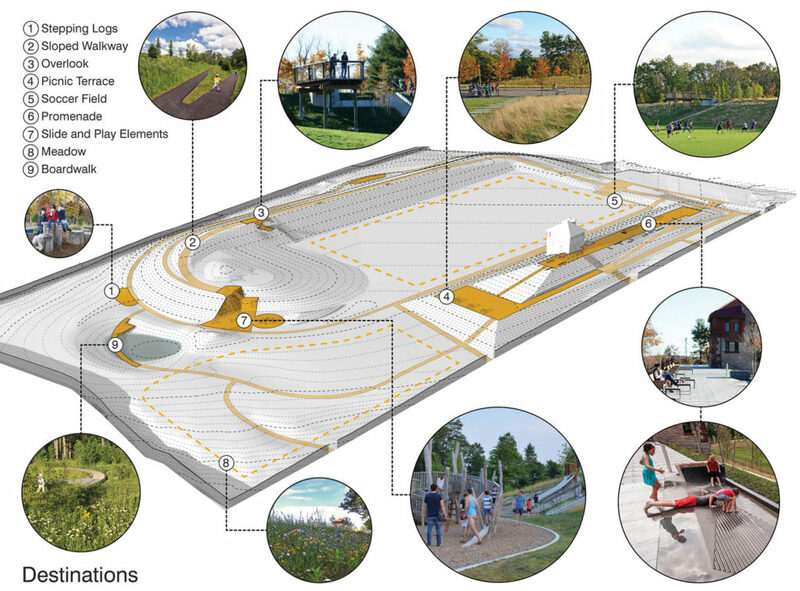 We led the Town through an extensive 15-month public process to develop the park design. 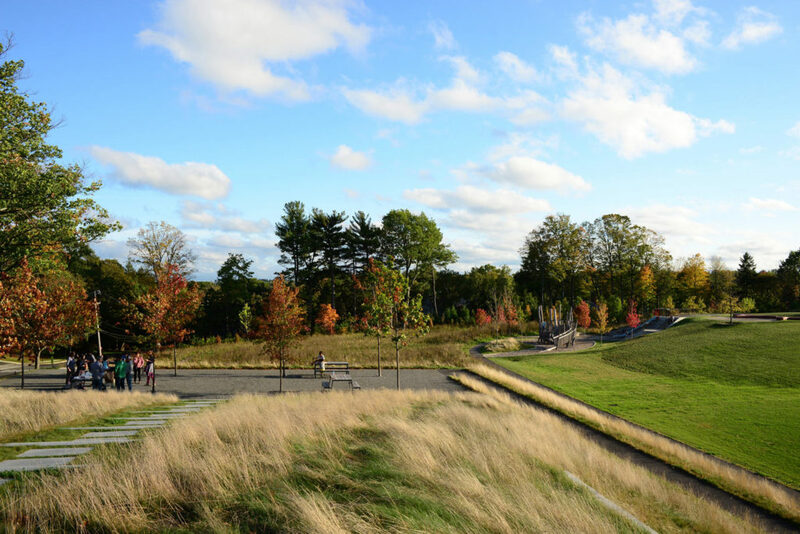 The main hurdle to overcome was to allay the concerns of neighbors facing a dramatic shift in the site’s usage from an abandoned reservoir into an inclusive, fully-programmed park for residents and the public to enjoy. 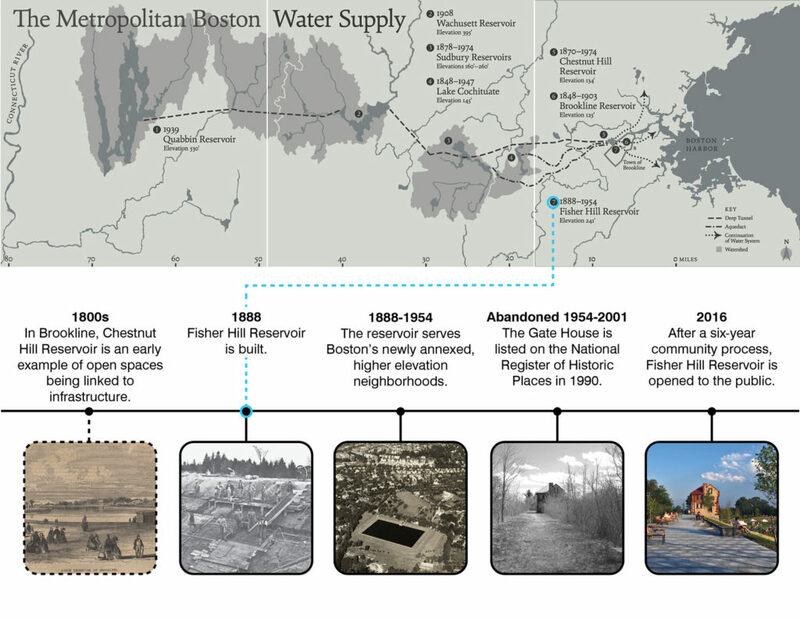 In addition to their historic value, maintaining most of the reservoir’s landform offered the added benefits of creating unique topographic opportunities within the park and avoiding the substantial and unnecessary monetary and environmental costs of disposing of the fill material off site. 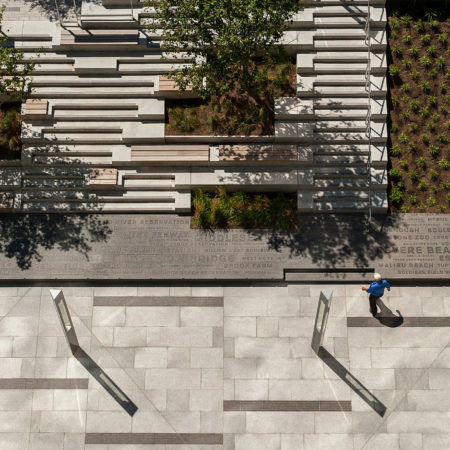 A series of terraces and ramps create access to unique vantage points throughout the site. 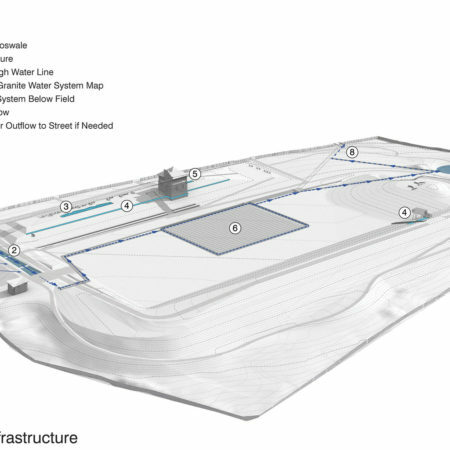 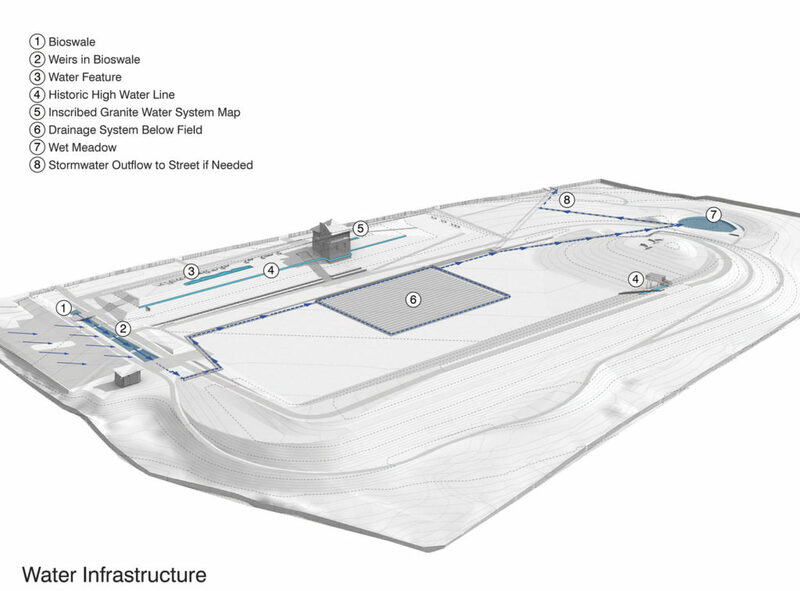 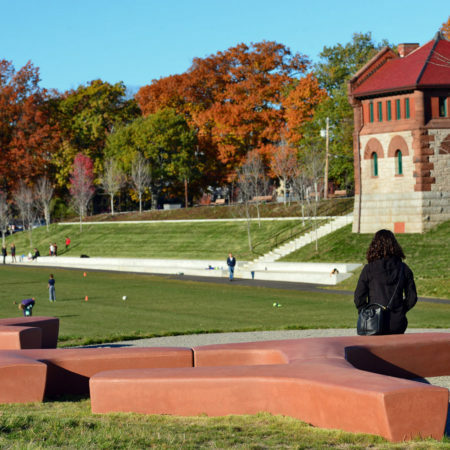 Only the north and southeast portions of the berm were removed to provide sightlines into the reservoir basin and allow multiple entry and exit points of the park to improve site safety. 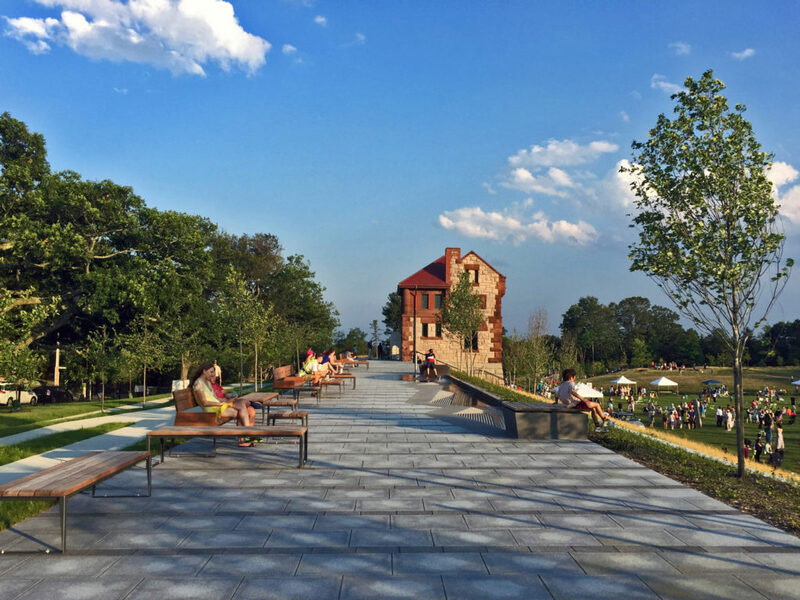 The restored historic gatehouse is grounded by a more formal granite promenade with ample seating that overlooks the athletic field. 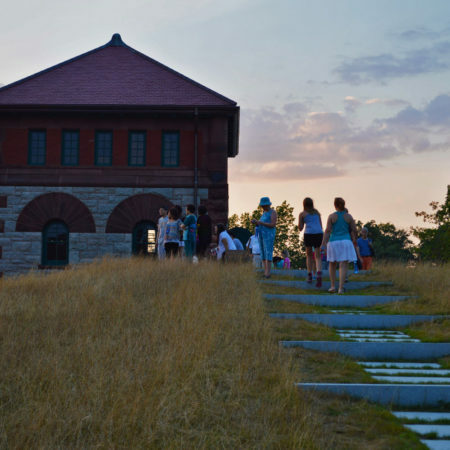 The Town plans to eventually use the gatehouse interior as a gallery exhibit space. 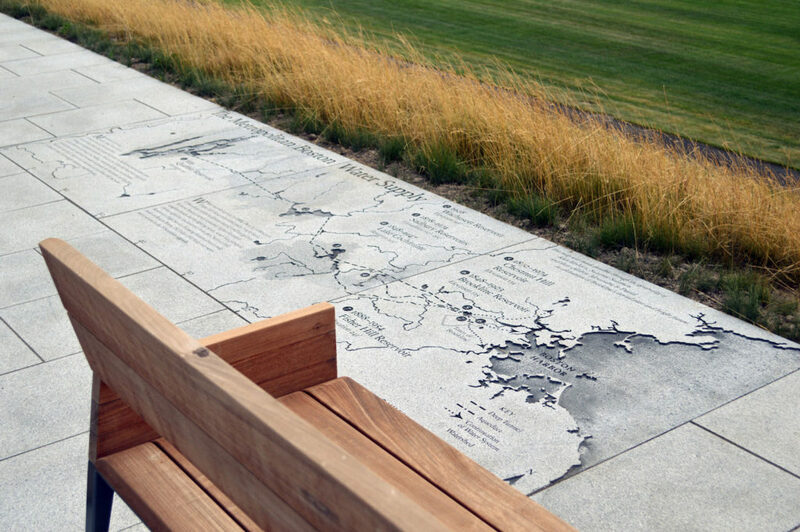 An interactive water feature on the promenade was custom-designed using precast concrete and helps connect the site to its past in a playful manor; while an inscribed granite map of the Boston Water Supply System provides more context of the park’s history. 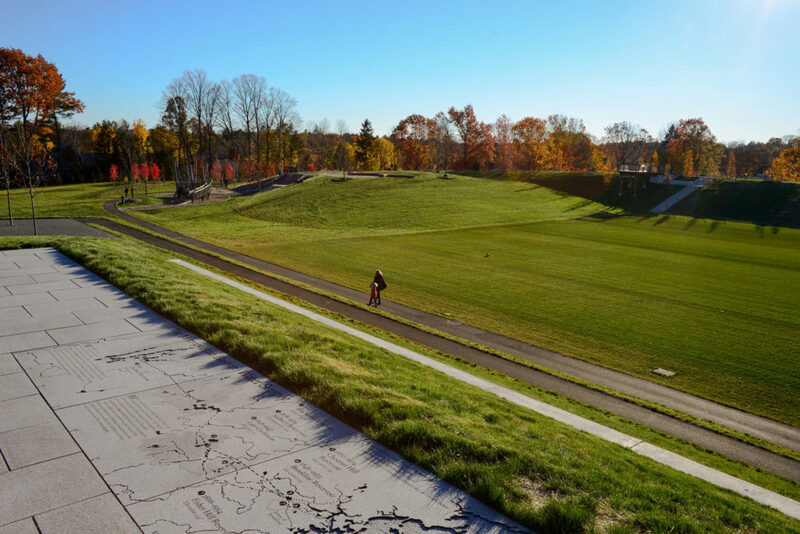 Slightly below the promenade, and visible throughout much of the park, runs a concrete wall along the upper portion of the landform interpreting the reservoir’s historic high water level at 241’. 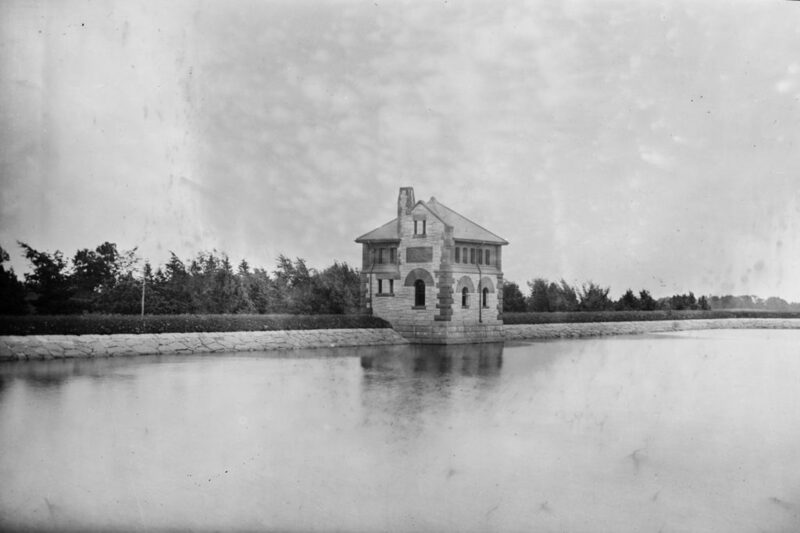 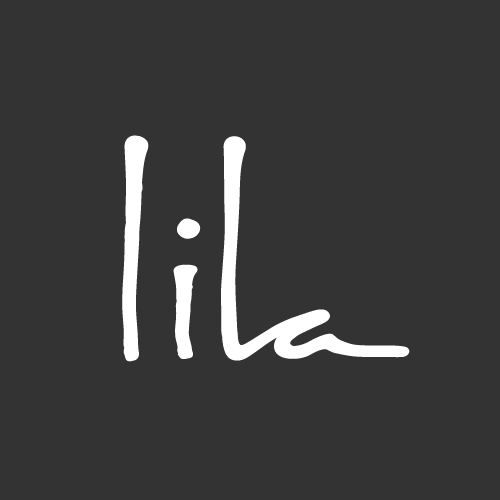 It is marked on the site with inlaid steel lettering on the gatehouse stair’s intermediate landing. 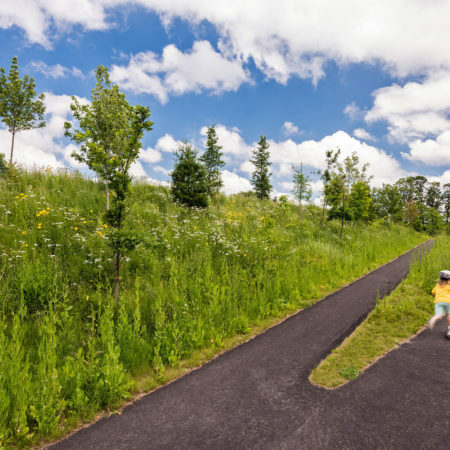 A network of fully accessible paths encircle the 10-acre park creating half-mile loops that meander and undulate along the historic landforms. 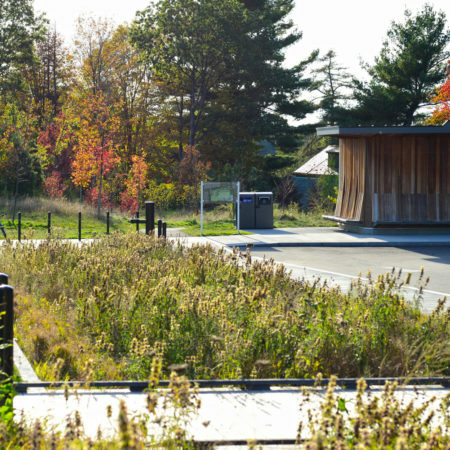 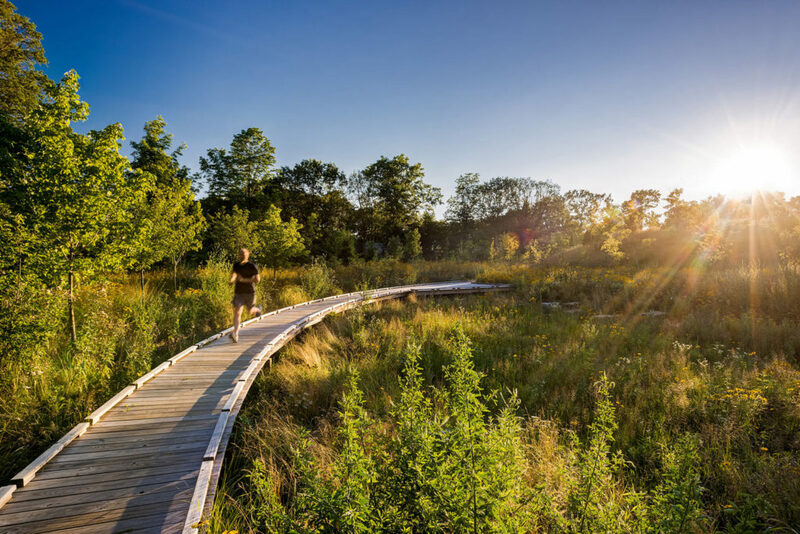 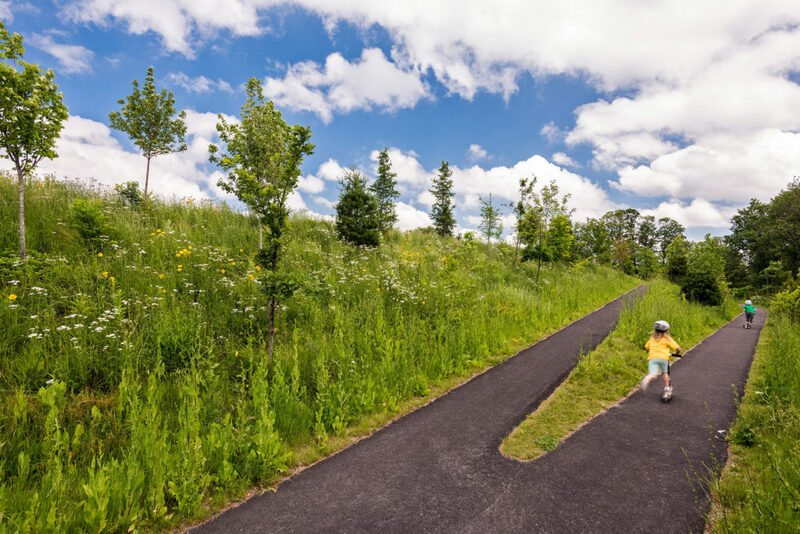 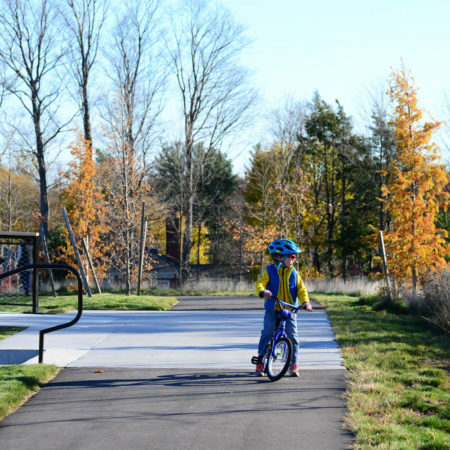 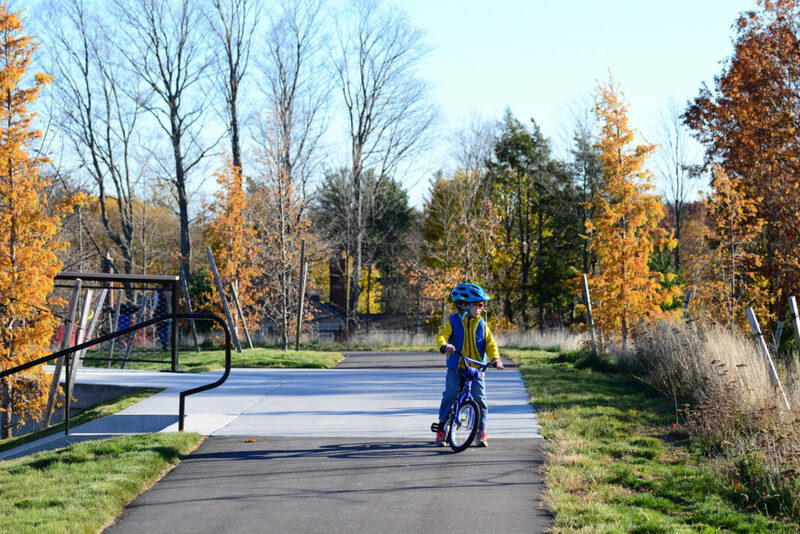 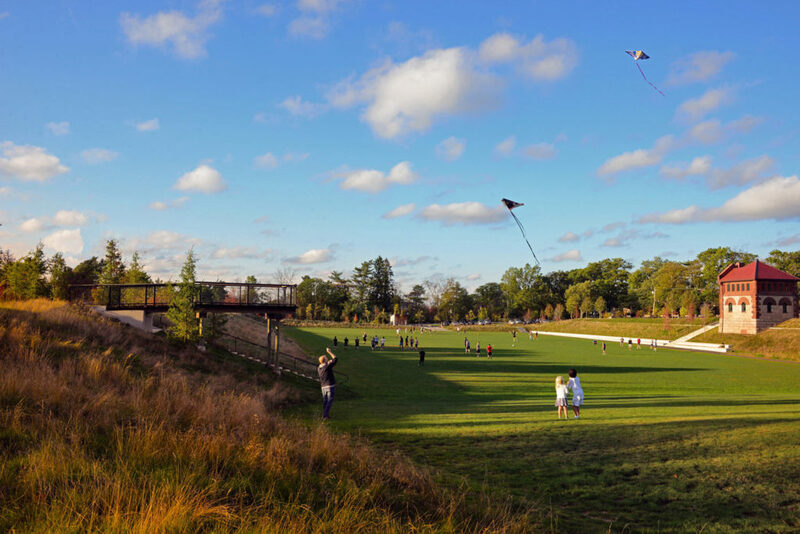 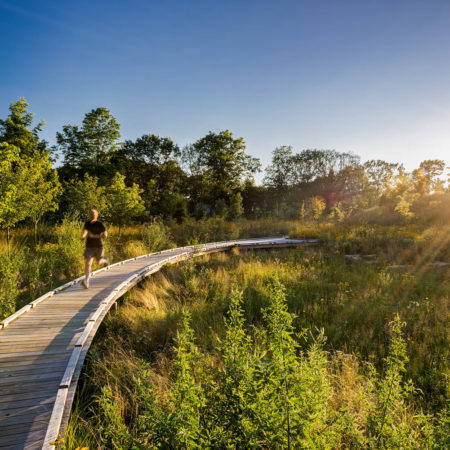 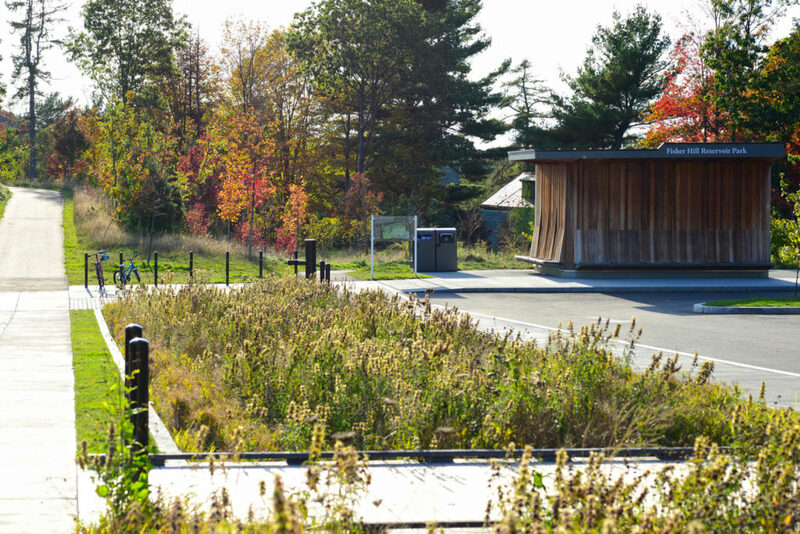 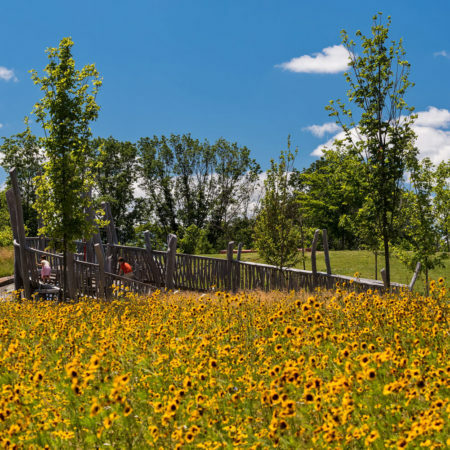 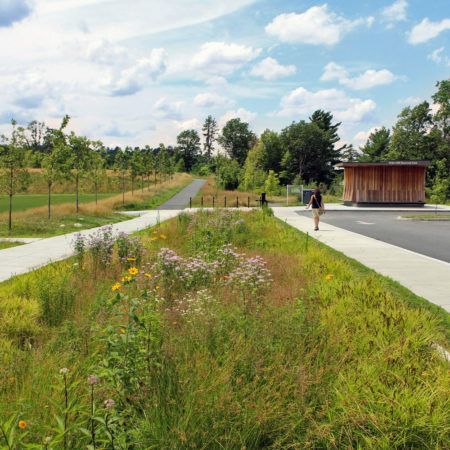 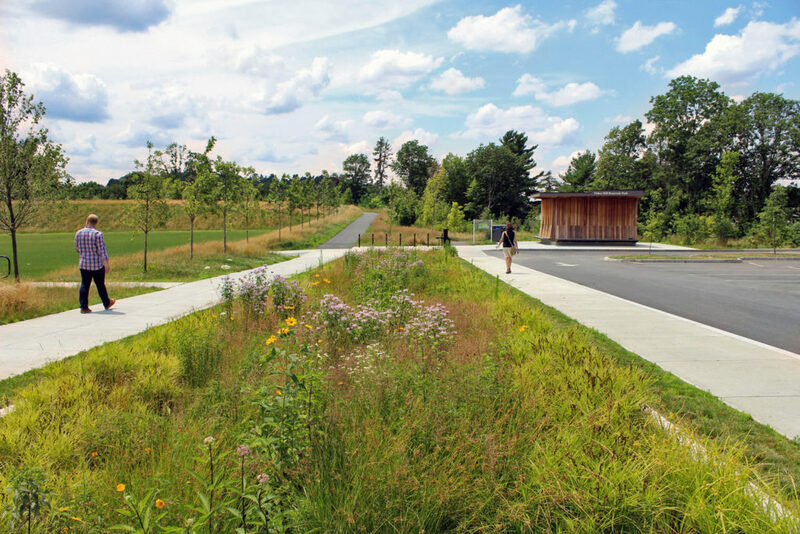 The paths have become a favorite for kids on wheels, runners and many others, and bring visitors through different landscape typologies from woodlands to meadows. 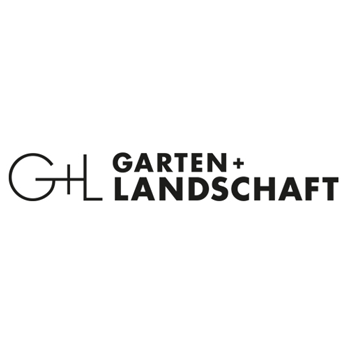 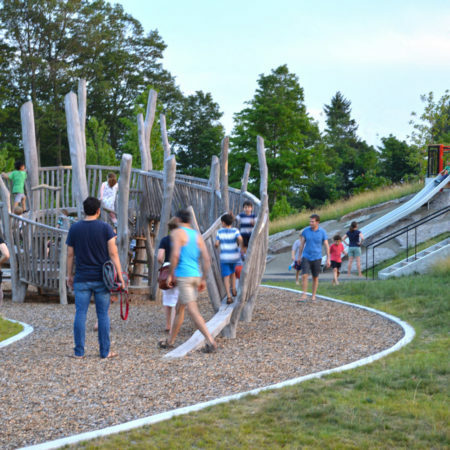 Along the paths are additional play features including an embankment slide and artist-designed sculptural wooden play structures made from locally-sourced black locust. 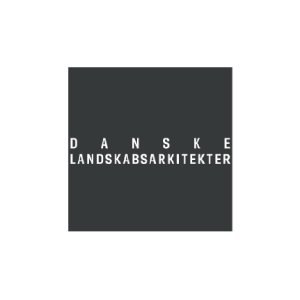 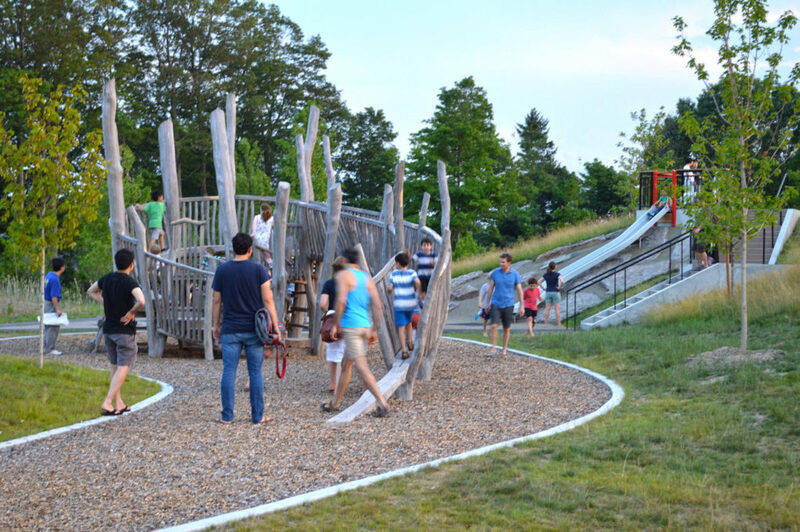 Meeting the request of unconventional play, the main wooden climber has the feel of a fortress allowing kids imaginations to run freely and can stand alone as an architectural element. 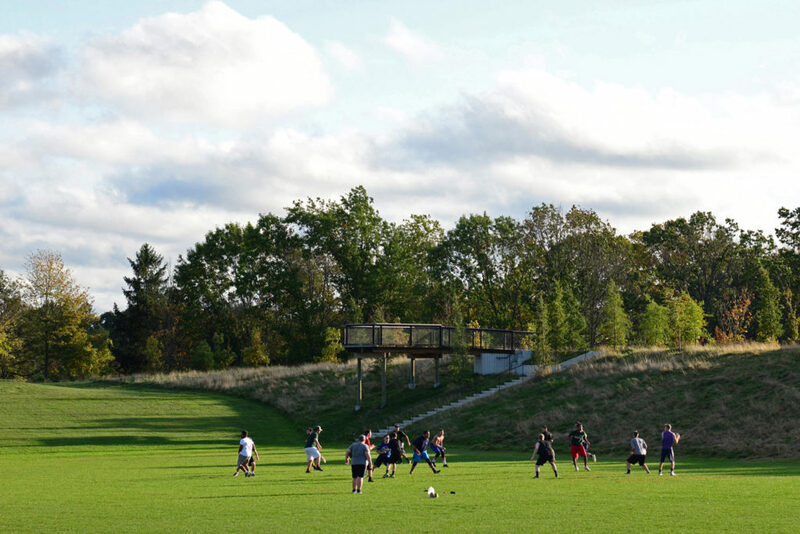 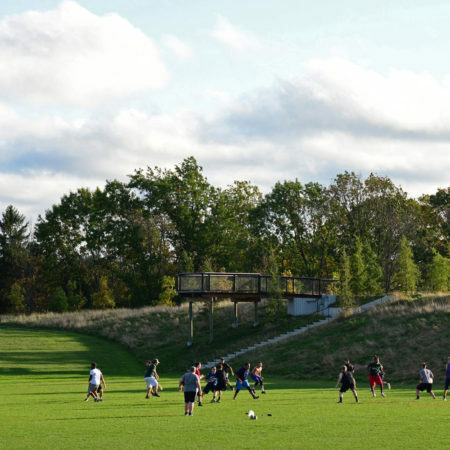 The main open space, was once the basin for the historic reservoir and is designed to fit a soccer field, but also plays host to a diverse group of users and uses from nearby college students playing frisbee and football to larger community events hosted by the Town. 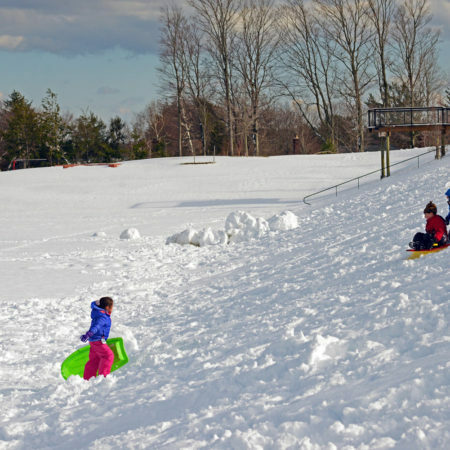 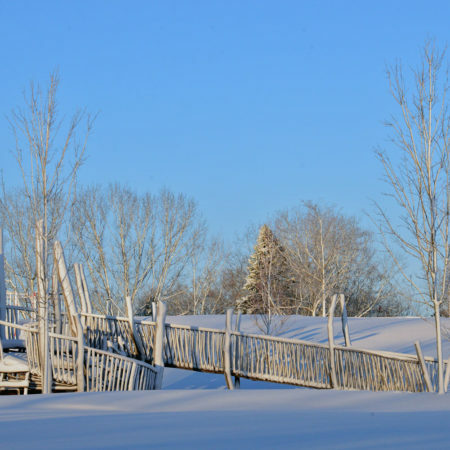 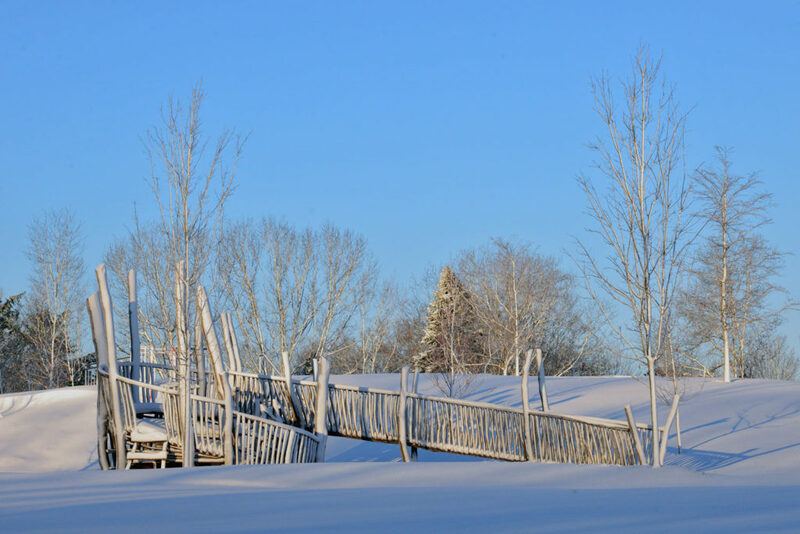 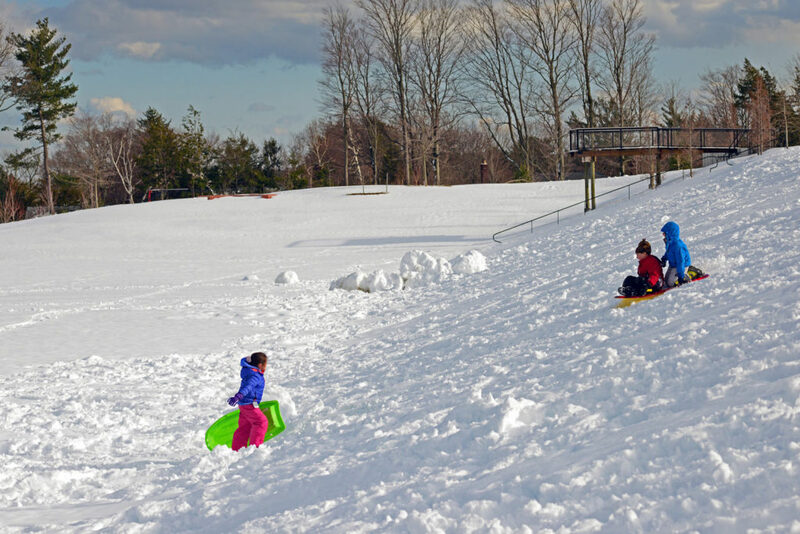 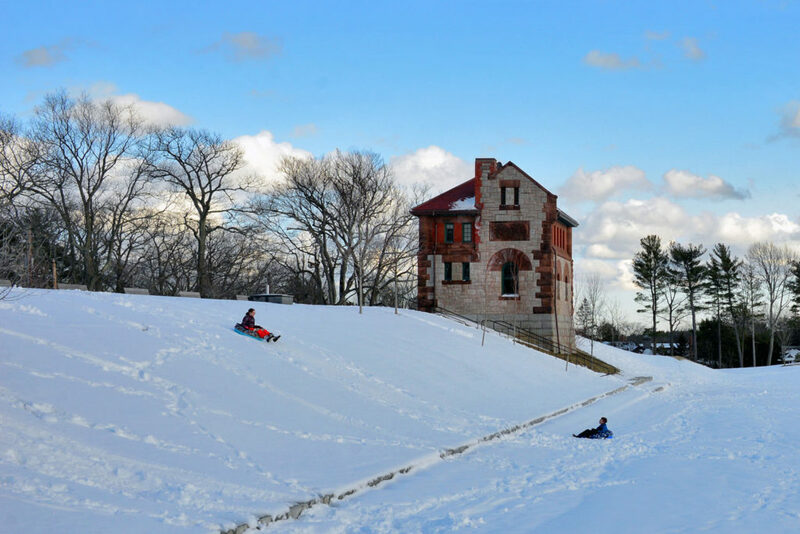 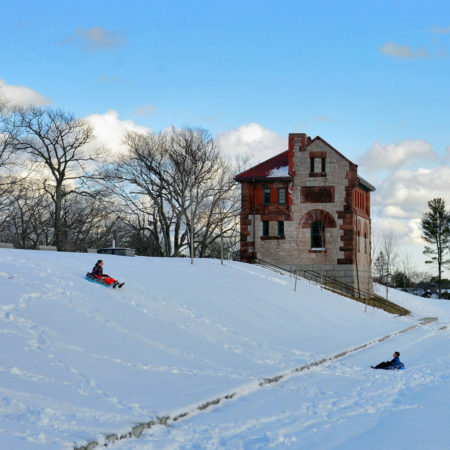 The surrounding original landforms provide further activation throughout the year with kids rolling down the slopes in the warmer months to sledding in the winter. 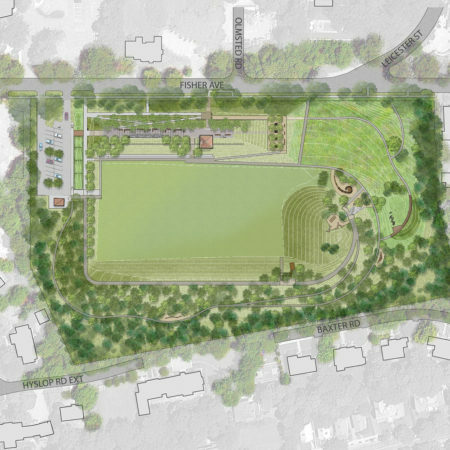 The planting plan for the site is diverse: no-mow grasses cover much of the slopes and help reduce fuel consumption and maintenance costs for the Town; a meadow and wet meadow anchor a portion of the southern part of the park; layered woodlands wrap around the outer edges to provide screening from the adjacent residential neighbors; and the front of the park facing Fisher Avenue is more formal with plantings of maple, oak and black tupelo. 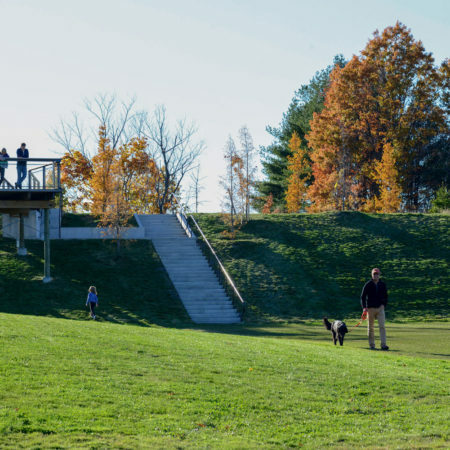 A planted swale collects and filters stormwater from the parking area carrying it to a catch basin installed below the soccer field which ultimately drains to the wet meadow during heavy storm events helping to keep all stormwater on site. 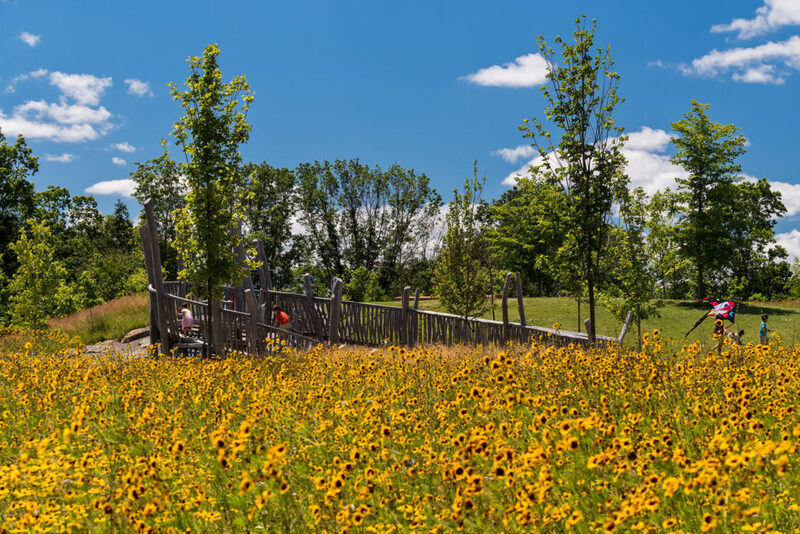 The biodiverse plantings both create wildlife habitat and add seasonal interest throughout the park. 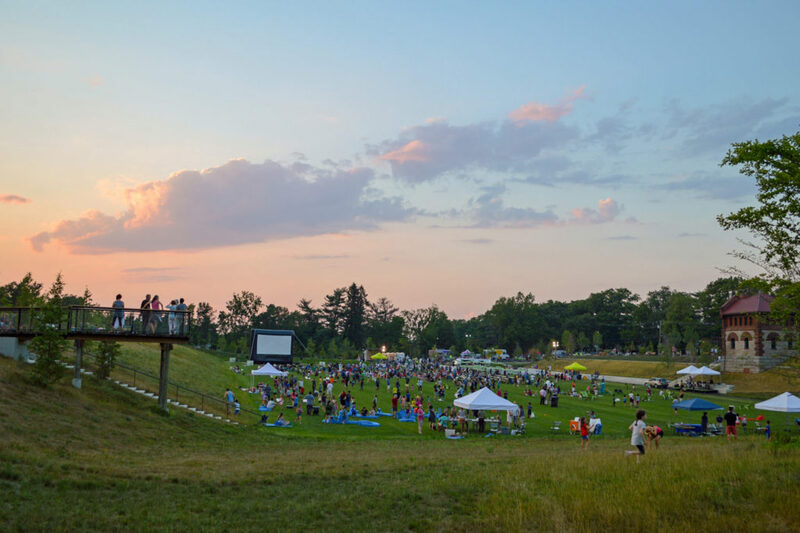 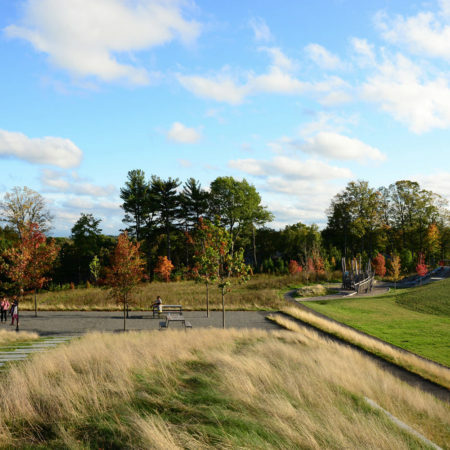 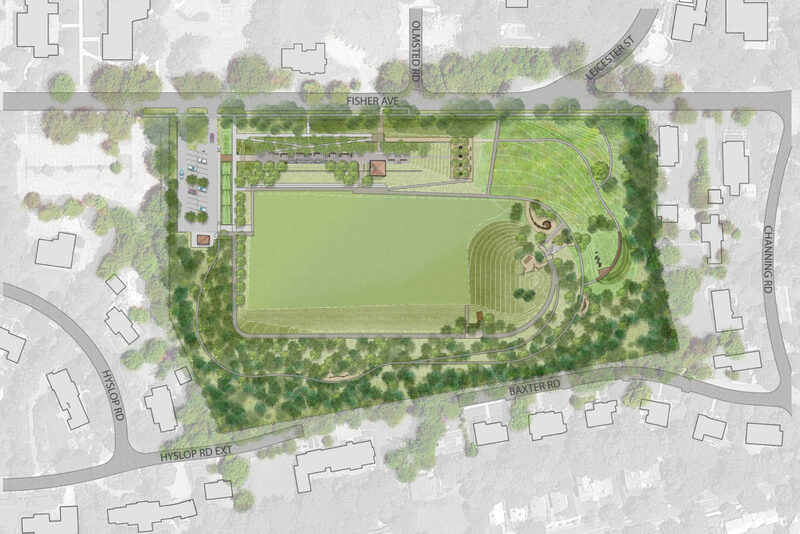 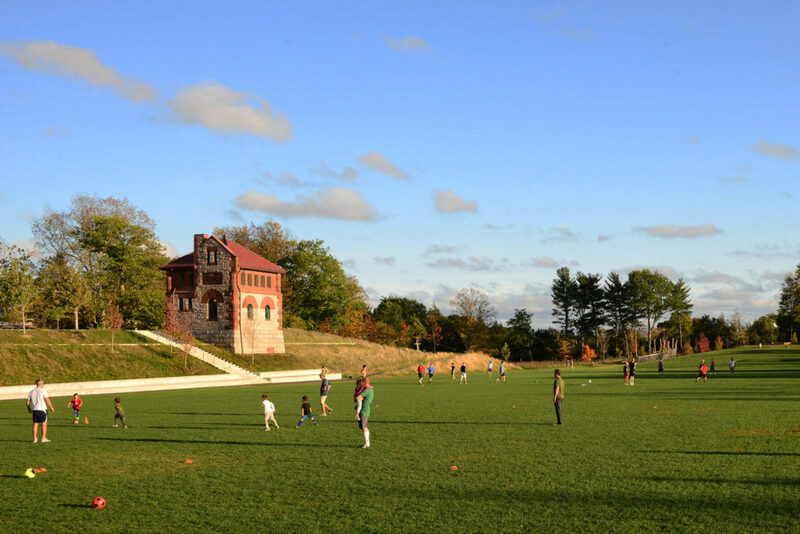 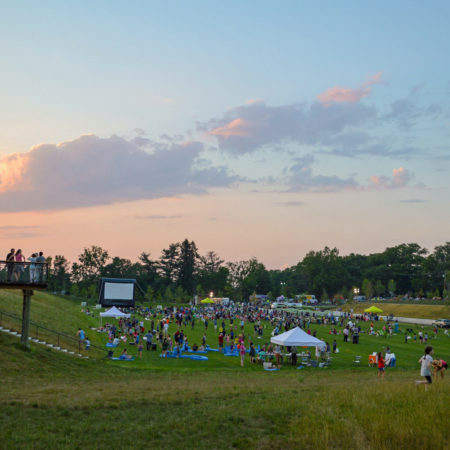 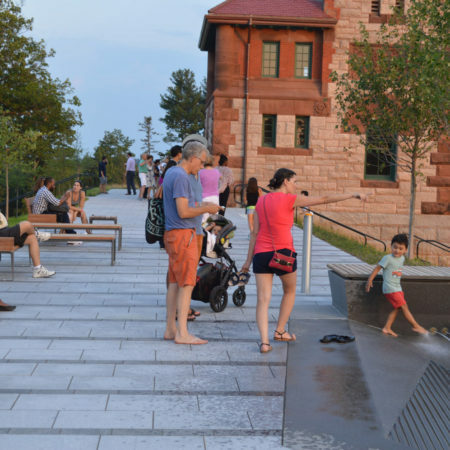 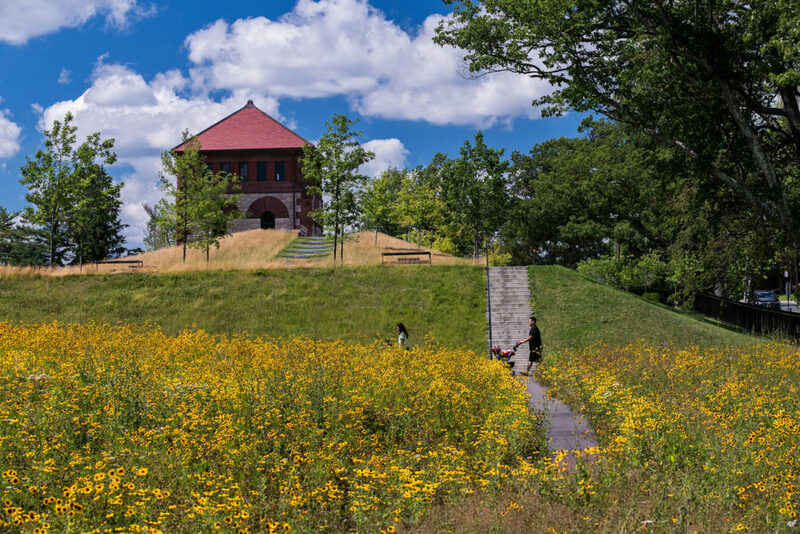 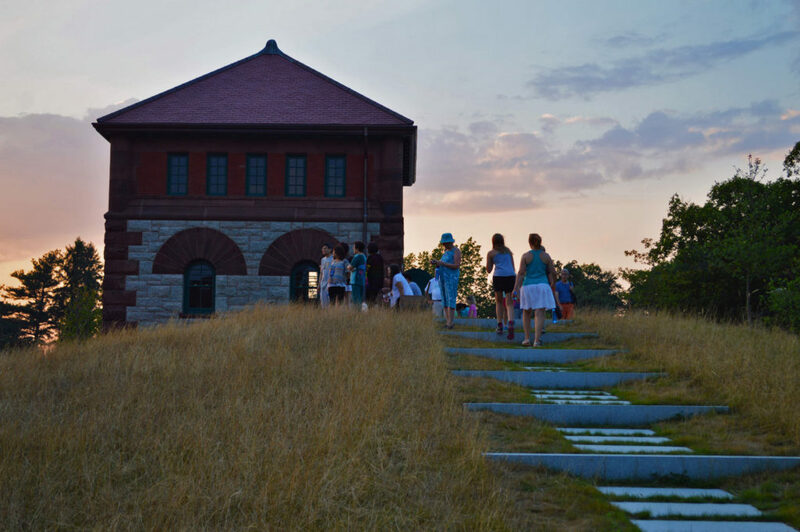 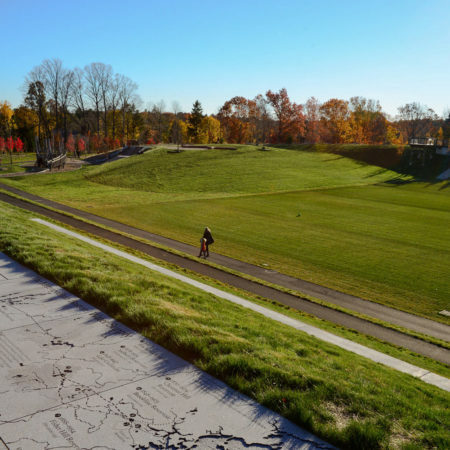 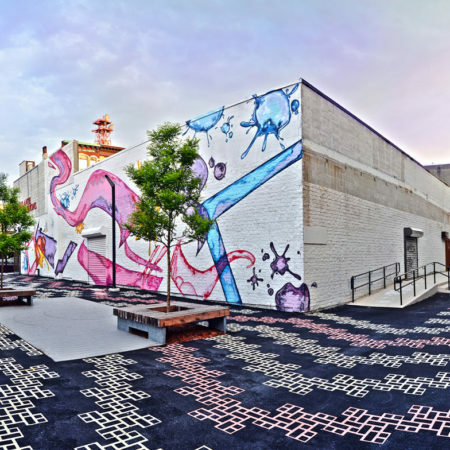 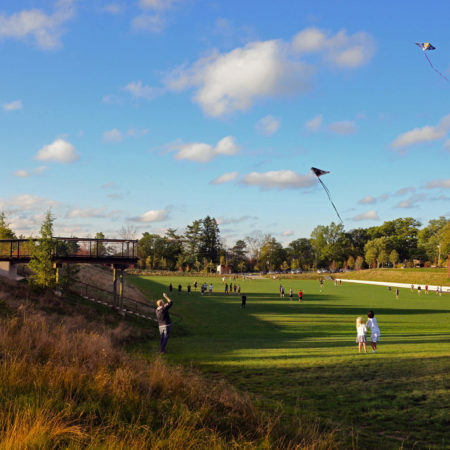 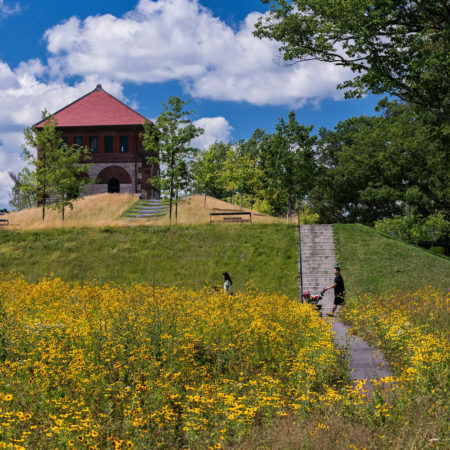 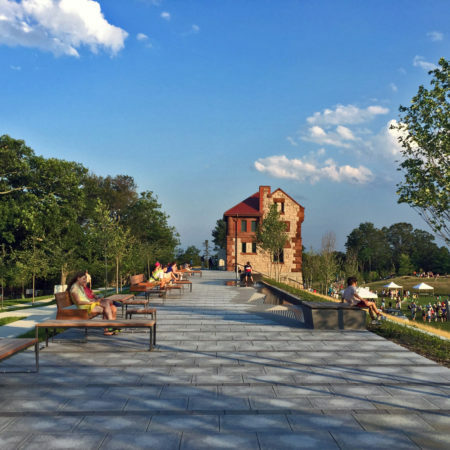 The resulting park has become a destination for the public while balancing the modern-day needs of the Town, preserving the cultural importance of the site and connecting it to the historical context of the greater Fisher Hill Historic District.